Following are some stats you may not know from the Packers 27-20 win over the San Diego Chargers. All stats are from the regular season unless otherwise noted. The Packers are now 7-1 in their last eight home games versus AFC West teams. The last loss to an AFC West team at Lambeau was on October 12, 2003 when Green Bay lost 40-34 in overtime to the Kansas City Chiefs. The Packers are 12-2 in their last 14 games against AFC West foes. 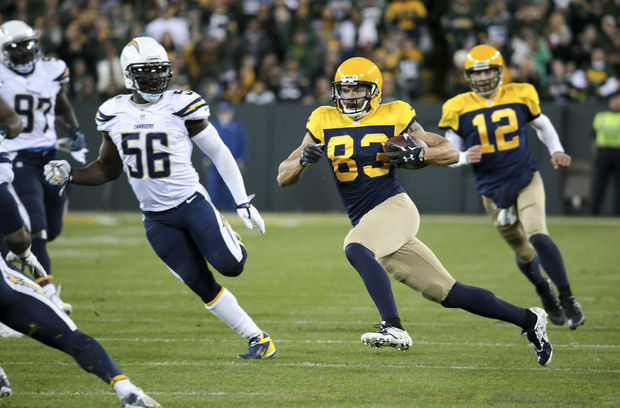 Green Bay is now 10-1 all-time against the Chargers, a .909 winning percentage. That winning percentage is the Pack’s best versus all NFL teams. The next best is a 4-1 record (.800 winning percentage) against the Baltimore Ravens. San Diego’s 1-10 (.091) record versus the Packers is their worst against any team. The Chargers next worst record against an opponent is 1-8 versus the Atlanta Falcons. The Packers are 10-5 in their last 15 games when the game is an afternoon start (3pm to 4pm CST kickoff). They have now won seven straight games that start in that time. James Starks became the 22nd Green Bay player since 1966 (Super Bowl era) to have a rushing and pass receiving TD in the same game. Eddie Lacy had three such games last season. Ahman Green tops the franchise list with nine such games since 1966. Starks 65-yard run for TD in the first quarter was the 19th longest rushing TD in Packers history and the 11th longest rushing TD from scrimmage at Lambeau. Ahman Green has the team record with a 98-yard TD run. Starks became the second oldest Packer to score on a TD run of 65 yards or more. Green was 13 days older when he ran for a 70-yard TD run on October 22, 2006. The Pack had the lead after the end of the first quarter and have now won 15 straight (11 straight at Lambeau) when they lead after the first quarter. They also had the lead at halftime and have now won 17 straight when they are ahead at halftime. San Diego’s Keenan Allen had 14 catches for 157 yards. He became the fourth receiver to have 14 or more catches in a game versus the Packers. The last receiver to have 14-plus receptions in a game against Green Bay was Buffalo’s Andre Reed in 1994 when he had 15 catches. Chargers’ QB Philip Rivers became the 13th opposing QB to pass for over 400 yards in a game versus the Packers (he had 503 yards passing). The Packers are now 7-7 in games where the opposing QB has 400-plus yards passing. Note: Drew Brees had two games with 400-plus yards passing against Green Bay. Rivers became the first opposing QB to complete 40 passes against the Packers in a game. He also became the third QB to attempt 60 or more passes in a game (Rivers attempted 65 passes) against the Packers (Miami’s Joey Harrington had 62 attempts in a 2006 game; the 49ers Steve Young had 65 attempts in a 1996 contest). The Packers have won all three of the games where the opposing QB attempted 60-plus passes. Starks had his third 100-yard rushing game in his career (he carried the ball 10 times for 112 yards). It was the eighth time in Packers history that a player had over 100 yards rushing with 10 or fewer attempts. At age 29 and 235 days, Starks became the ninth oldest Green Bay Packers player to rush for over 100 yards in a game. The last Green Bay player 29 years of age or older to gain 100 yards rushing in a game was Ahman Green on December 13, 2006 at age 29-290 days. This was the 15th game in the Super Bowl era (since 1966) that a Packers defense allowed 500 or more total yards in a game. With the win yesterday, the Pack is now 4-11 in those games, although they are 3-3 in such games at home. It’s interesting to note that although they gave up 500-plus yards to the Chargers, the 20 points scored by San Diego is the fewest of any team that gained 500 or more total yards in a game against the Packers. Yesterday was the 30th game since 2010 that Green Bay scored in each of the four quarters. They are now 27-3 in those games and have won 11 straight when they score in each of the four quarters. The Packers had only 22 minutes of possession in the game. It was only the second win (in 23 games) since 1966 when they had 22 or fewer minutes of possession in a game. The other win was a 48-47 win over the Redskins in 1983 on Monday Night Football. Bonus stat: The Packers get a bye next week, Week #7 of the season. When they Packers have had a bye on Weeks #3-#6 in a season, they are 4-5 in the next game. When they have a bye on Weeks #7-#10 in a season, they are 13-4 in the game following that bye.